One of our top-of-the-line units, the MSU Pro Solar is a fully self-contained, self-powered surveillance camera system. High-quality security cameras are powered by an efficient solar array. Featuring energy efficient bright white LED lighting and online accessible remote management tools, the MSU Pro Solar is the ultimate in security for any jobsite where power is unavailable. Clear, obvious security measures are one of the best ways to secure a construction jobsite. After all, the goal of any security system is to prevent theft and vandalism from occurring at all, not simply to catch it after the fact. Construction materials theft, equipment theft, and other crimes are still a large problem in the industry. Copper, wire, lumber, and other materials are highly valuable. Combined with the perception that jobsites are unsecured “low-hanging fruit”, it is no wonder that casual thieves often converge on construction areas at night. The prospect of simply walking onto a jobsite with a few people, loading up a pickup truck with whatever is in plain sight, and driving off is a tempting prospect to a certain element. The good news is that this relatively simple scheme is all the average criminal is willing to undertake. Faced with visual theft deterrents such as the MSU Pro Solar’s imposing array of motion-activated cameras and LED lights, most potential thieves will simply turn around and head elsewhere. Of course, the cameras need to also get the job done if an intrusion does occur. Dummy cameras, though inexpensive, ultimately become useless as word inevitably gets around that they are not actually recording anything. Most materials theft is due to casual thieves, not criminal masterminds. Given some resistance, they will move on to a softer target. The MSU Pro Hybrid is physically imposing, solidly built, and makes it obvious that your jobsite is protected. Floodlights, strobes, and two-way audio features go even further to scare off casual thieves. Flexible configuration means your MSU Pro Solar is customizable to your needs. The MSU Pro Solar is fully functional, not just impressive to look at. Remote management and online webcam viewing from any computer or mobile device. Sturdy mobile cart means the unit can be rolled around to provide maximum coverage, and taken to another site at the end of construction. 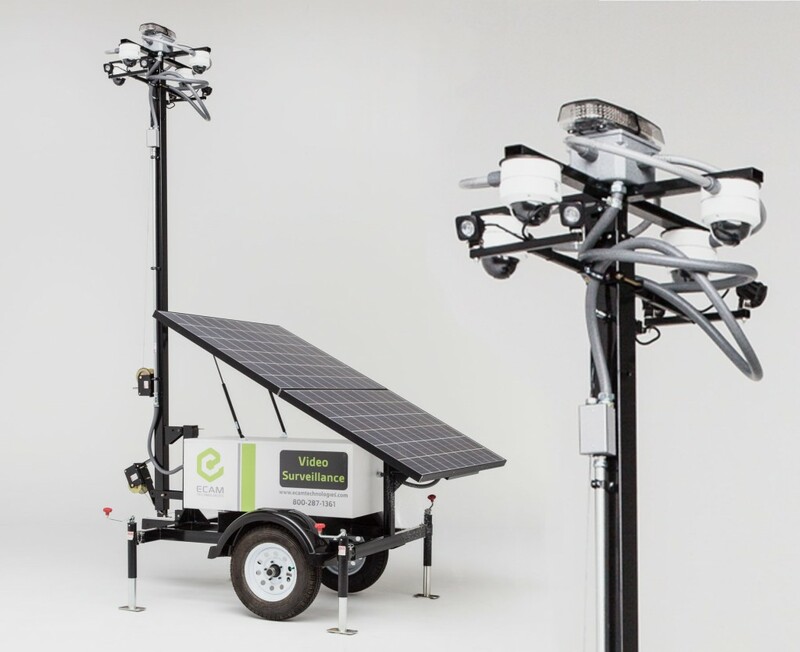 Powerful white light LED array allows the MSU Pro Solar to also function as a portable light tower for after-hours work. Installing cameras isn’t always so easy, though, which is why the MSU Pro Solar has been designed to be fully self-contained. Typical construction cameras must be wired back to a central recording station, and often must also be separately powered. Their power needs are not tailored to the construction environment, and the result is usually a mess of wires strewn across the jobsite. These are inefficient and insecure, prone to being cut or simply tripped over. The MSU Pro Solar, on the other hand, carries its own recording hardware. It also employs a hybrid system to power itself, without the need to rely on on-site power. There are no wires to run, and no wires to be cut. 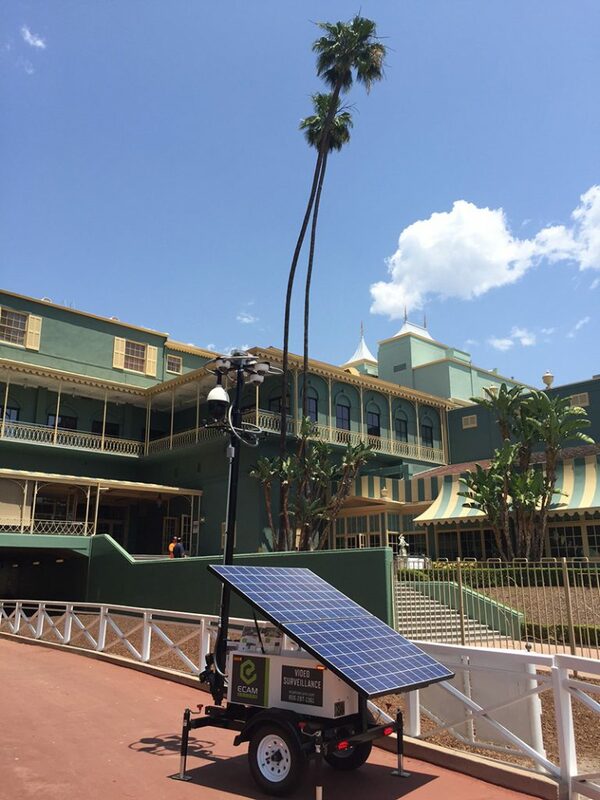 The integrated solar energy panels keep the cameras and recorder running during the day, and also charge a battery for overnight use. The energy savings attained by removing the surveillance system from grid power is often enough to let the MSU Pro Solar pay for itself, especially given that it can be easily moved to another site after construction is complete. At the same time, the unit’s options for license plate capture, strobe, pan / tilt / zoom, and other cutting-edge technologies bring it on par with the most elaborate non-mobile surveillance solutions. Its remote management and webcam capabilities, along with the accompanying UL-Listed Central Monitoring Station service, mean the police, private guards, or local personnel can be dispatched within seconds of a break-in. The MSU Pro Solar is a powerful tool to protect the environment and your bottom line, as well as your investment in materials and equipment. Easy to install without the need to run wires or mount cameras in high or difficult-to-reach locations, the labor costs of an MSU Pro Solar are minimal. 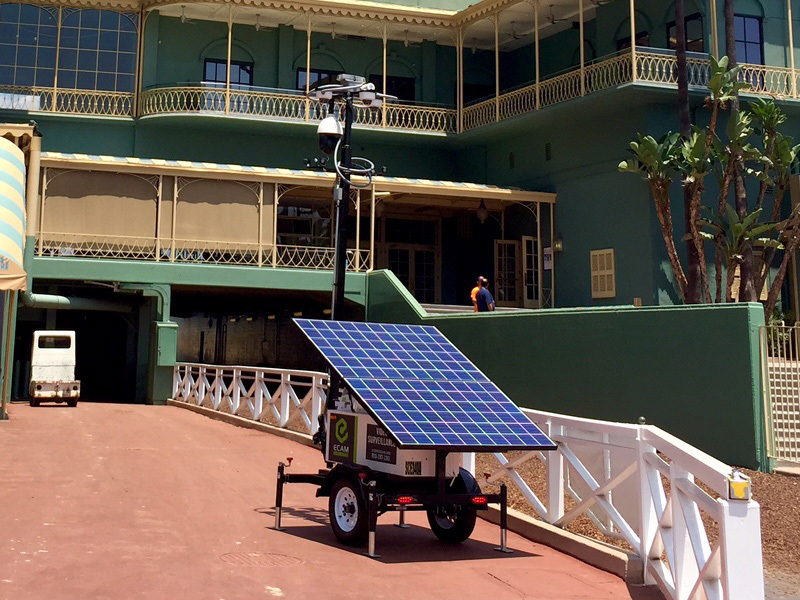 As it is entirely self-contained, there is no need for power, coaxial, or network wiring between the cameras, the solar panels, and the recorder. The energy savings realized by leveraging renewable resources for powering the cameras means the MSU Pro Solar can easily pay for itself over the course of several jobs. The durable, integrated mobile cart means the unit can simply be rolled away when the job is done, ready to serve at another location. Reuse is the best form of recycling, and it is far greener than creating waste by tearing out wires and cameras when the job is done. This green, energy efficient philosophy even extends to the lighting. Rather than rely on halogen or iridescent bulbs, the MSU Pro Solar utilizes LED lighting. Long-lasting and power conservative, they still provide an immense amount of bright white light. Integrated solar energy panels mean no electricity bill for security or lighting. Save on labor costs by eliminating the need for wire runs and camera mounting. Fully mobile with a heavy-duty cart. Move around the job site as needed, and take it with you when construction is done. Pay only for the options you need. Fully customizable with a range of camera and lighting options, including night vision thermal cameras and license plate capture. Online accessible webcam technology allows for remote management, reducing the need for onsite security. Energy efficient LED lighting array allows the MSU Pro Solar to act as an environmentally friendly illumination source. Pair with professional monitoring from our UL-Listed Alarm Central Station for complete security around the clock. With its self-contained power source and other energy efficient features, the MSU Pro Solar is a great choice for construction firms seeking to reduce their environmental footprint. At the same time, its powerful LED lighting and top-notch range of surveillance cameras mean security is not sacrificed. 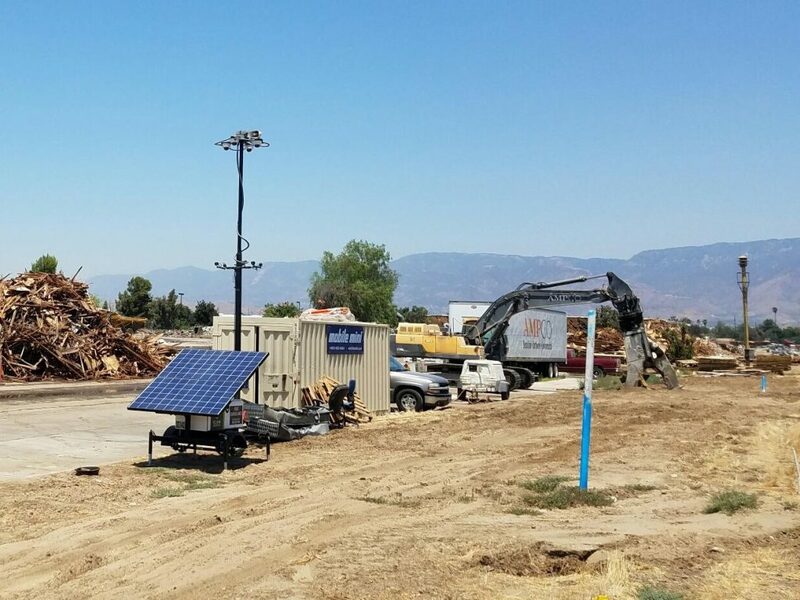 Easy installation, inexpensive operation, and features like motion detection and night vision mean the MSU Pro Solar is the best security choice for almost any jobsite.